You know how when you love something so much, some aspect of art or culture in general, you just want to make it known to the world? That is what I want to do. Feel free to run away screaming now, I won’t be offended. I’ll just lock the door next time. 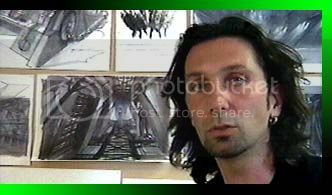 I wanted to natter on, again, but this time properly, about Tatopoulos and his studios. Or more specifically, them there werewolfers. And how much I love them. 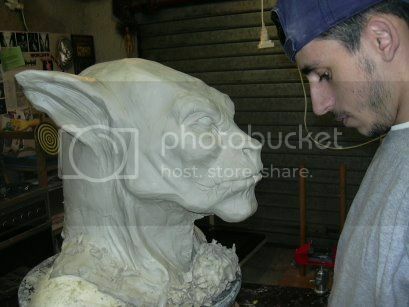 Tatopoulos Studios, are a special effects company, and I think the second best in the entire world. Or possibly first best…you know what I mean, the point is, don’t get me started, or I shall dather all day. He has done work on films such as Godzilla, he made the Godzilla babies, Silent Hill, Independence Day, Stuart Little, (possibly the only cute work he has done) and among other things, those amazing amazing technological masterpieces that were the robots in I Robot. This is Patrick. Say hello to Patrick. Look here if you are interested. But later! For now, werewolves. Tatopoulos's best work. 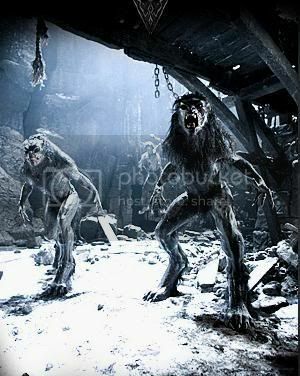 These werewolves are, I think, the best piece of art, in the whole world. Ever. Screw all this stuff you see in museums, nah, that's got nothing on Mr Tatopoulos. Why are these werewolves worthy of such adulation? I shall tell you why, pull up a cushion. No talking while the crazy lady rambles, please. 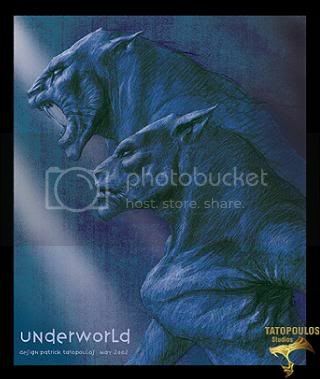 If you were to look closely, anyone would find, that these werewolves in Underworld, are internally almost as complex as a living organism. Before the suit is made, comes the concept art, which is quite pretty. 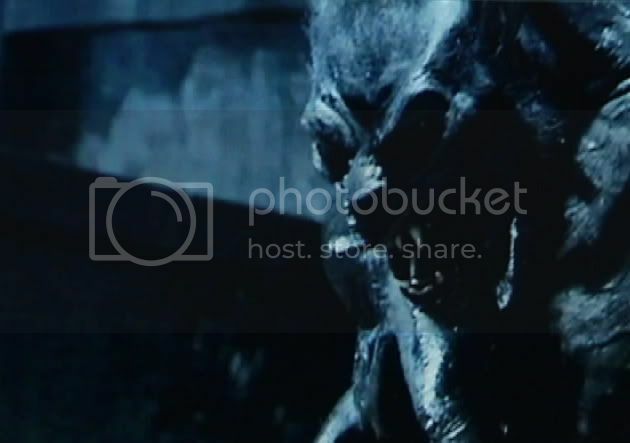 See the werewolves are slightly catlike in their appearance, but unmistakable werewolves? I like that. 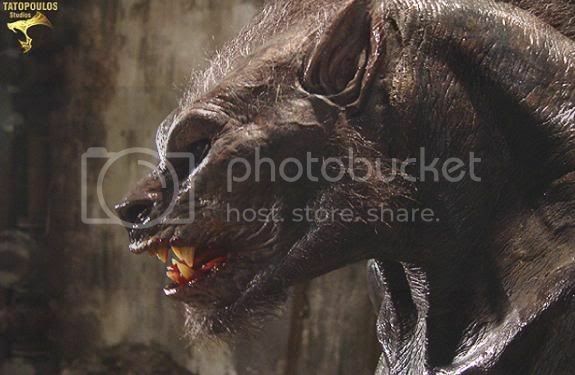 Almost all werewolves in film, look like wolves, and it is nice to see something more original, that still looks like a werewolf. Now for making the suit. 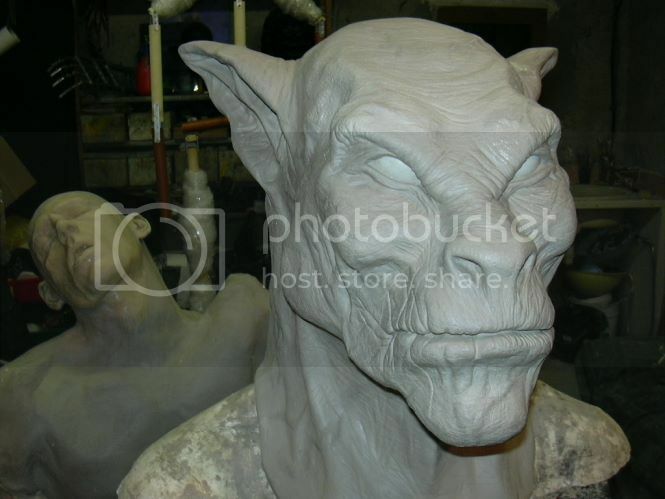 Firstly, they make a full cast of the actor who will play them, by covering them entirely in this white stuff that solidifies, and when they cut it off, they have a complete cast of the actor. They can then take this, in order to use the measurements when they build the costume. 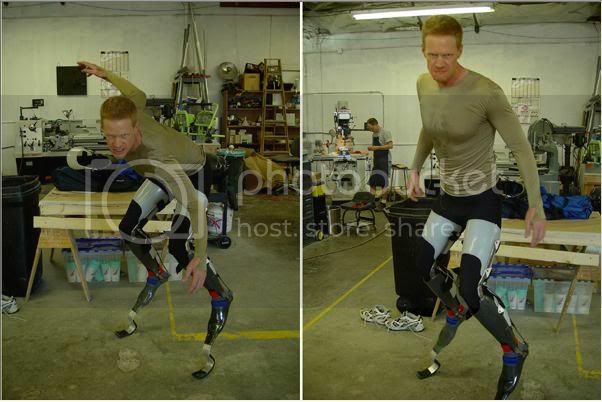 Then, they make a perfectly fitted metal framework, that sits around the actors legs and neck, firstly in order to make him a few feet taller, and secondly, to transform his normal human legs into fully functioning digitigrade anthropomorphic legs. These, he can actually walk and run and duck and move on. 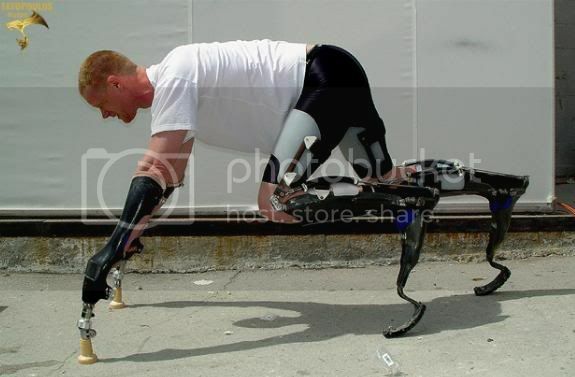 It’s amazing to see him running on these things, they give him massive strides! Then, they take the body cast and metal framework that they have of him, and with sculpt around it, and create a massive lightweight rubber suit. This rubber suit fits the actor perfectly, and only him, and is flexible and finely sculpted. I mean seriously, you can see all the muscles, including complex strutures such as the damn hard to get right serratus anterior, as well as all the viens running up and down the arms, and oh so many muscles, all over the body, and tendons and allsorts, they are so detailed that you have to pause things in order to take it in. It’s just astounding. Work of art. 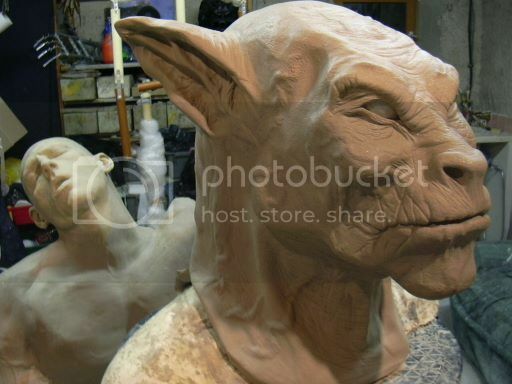 And then, they paint and airbrush the suit, giving it the darkened skin and texture that you see in the film. 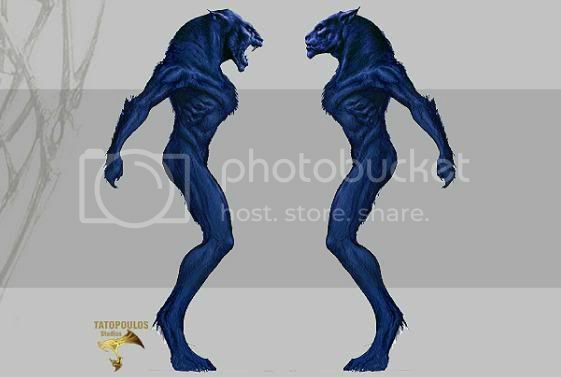 These werewolves have dark skin. And then they put the fur on. 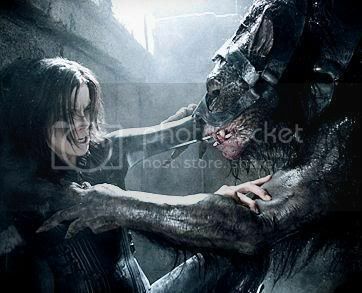 Now Len Wiseman (director of the film and Kate Beckinsale’s husband) said that he did not want werewolves that were incredibly hairy, because, he had seen so many werewolves in film that looked awesome, until then they put the fur on and ruined it by obscuring or concealing altogether the muscles and stuff. So, these werewolves do have fur, but not much. On their arms, and head, and running down their back, which I think looks rather cool. Okay, so we have the actor, skeleton, suit, and fur. What about the head? This anamatronic structure, is controlled by two other people with remote controls. 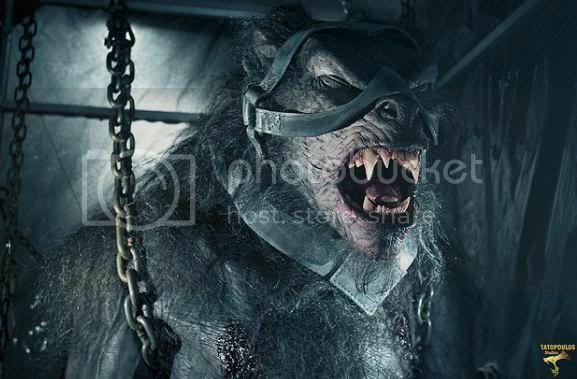 All the wires and….electronic stuff that I don’t understand, is compact enough to sit, strapped to the back of the actor, and the werewolf is massive enough to accommodate it easily. 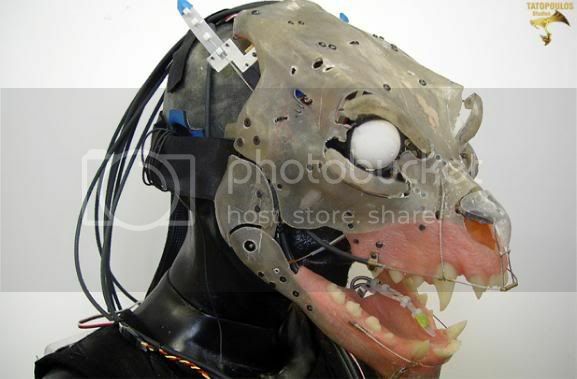 And over the top of the anamatronic head, is the flexible rubber head, which I think has a fantastic expression. When put together, this head sits on top of the actors own head. 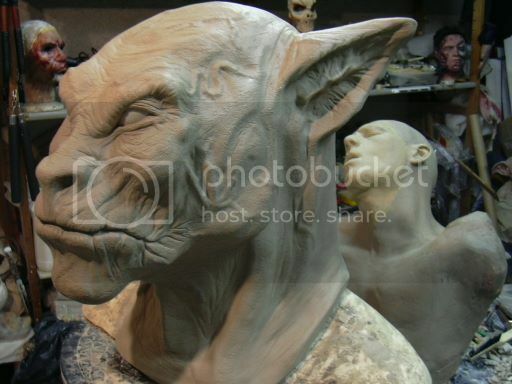 This, combined with the stilts, adds a few extra feet of height, making your traditional tall werewolf. The face, you really need to see moving, to be in awe of it. But you should be. In awe I mean. This wolfer is capable of a shocking amount of brilliant facial expressions, there is the traditional variations on growling, then there is yawning, roaring, blinking, looking around, twitching his nose, scowling, sniffing, moving his eyebrows, and so much more. 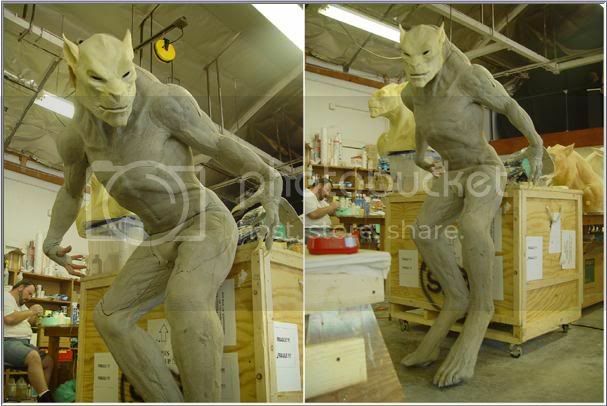 Once you put the stilts, suit, fur, and the head on the actor, he can still not only move, jump, run, duck, swipe, roar, sit down, fall over, and be harnessed to wires, but, he can even run along walls. Yup. You know the scene in which Selene is in Michael's apartment building, and the werewolves start running along the walls towards her, defying gravity as they do so? They were no CG werewolves, even though they look it. They were the men in suits, being held against the wall, by wirework. And they defy gravity and look like CG, when they are actually real. How amazing is that? Time for the happiness that is werewolf spammage. Werewolves in film are so misunderstood. They try to eat your face, because they care. Look, just...Loookk!! It's a guy in a suit. Can you believe it?? Showdown! Look at that scowl Selene's got. She's like, "Bring it, poodle!" Yes, contrary to popular belief, it is the werewolves who rule, while the vampires, in fact, drool. "So then I said to Len, you want your parking space back? Bite me!" 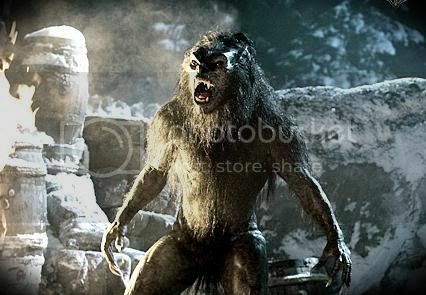 These werewolves can actually walk down the street, and people roar at people, unlike the pretty non existant CG wolves in films like Van Helsing and An American Werewolf in Paris. Although I love those wolfers, a lot, you can't touch them. They don't exist. Underworld wolves were made by artists, whereas Van Helsing wolves, were made more by computer experts, I think. Material versus pixels. I also admire the transformation sequence. Truth be told, I am a werewolf obsessive, (nah, really? Get out! ) and I cannot remember how many books I have read, and films I have acquired just so that I can watch the transformation scenes. I refuse to go into an essay comparing all the differing transformation scenes that I have seen and analysed, because to be honest, my fingers cannot take typing it all! 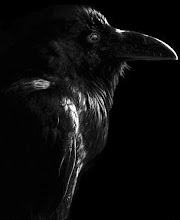 But I like the Underwolrd transformation more than any of the dozens of others that I know of, in film, and literature. I love the way in which the bones crack and the beast bulges and cracks it's way out of the man in such a noisy, grotesque, and ugly fashion. It just seems more realistic than any other, including the flashy pretty daft animation seen in Van Helsing. I also admire the storyline. If you were to actually read the fantastic standalone novel, which explains the film in more detail, and then beyond that, you would realise that it is quite a complex intricate, and most of all, original story. It features plotlines and twists concerning genetics that would baffle your brain if you blinked, and also, so many subplots not seen in the film. Including one that borders on the idea of reincarnation, and destiny. It is just...masterful. 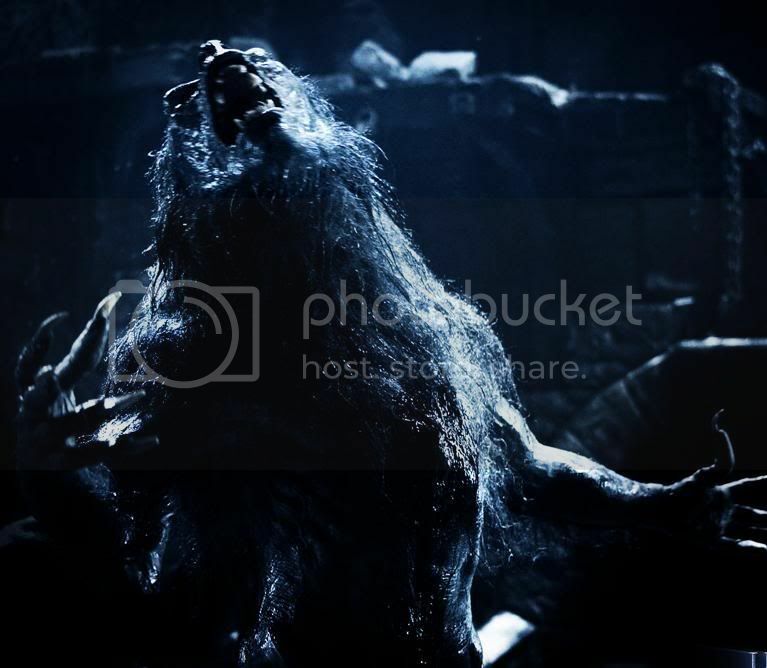 The only thing that I did not like, about this film, was the fact that they put so so much effort into werewolves that should not be hidden, and then they went and obscured them by shadows and rapidly alternating camera angles, so that you could not see them for more than a few seconds! Did you just see all the detail I went into, describing them? And you don’t see them for more than a few seconds! My, that is actually a crime, that is. 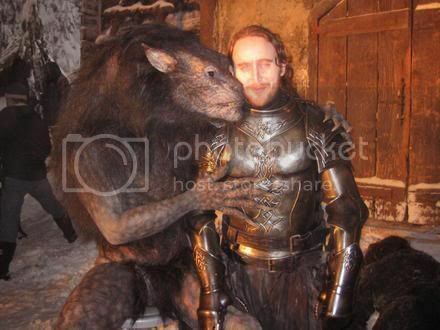 If you were to watch all the behind the scenes shots, where you see the werewolves being tested for the camera, you would see that there is no reason at all to not show them off like the works of art they are. In most films, they obscure the werewolves because, the werewolves are not very good...so they rely on the imagination of the viewer. I am so annoyed that they did this in the film, when I know for a fact how quality they were! Uh, I should stop now before someone lapses into a coma or I get repetitive strain syndrome in my fingers. Or both, I’m an overachiever. So, uh, in conclusion, oi loikes them thurr wolfers, I does. You can commence adulation now. Adore, damn thee, adore! Hey there Raevyn. After seeing this I got the notion that I must have a Lycan for myself. Here is just a sample of how it turned out..
Scrool down for a leg shot. I will be adding the completed shots later this week. Thanks for the inspiration to do this project. Any chance you could tell me what material they made the suit out of? Or the schematics for the feet? Digitigrade legs are quite difficult..